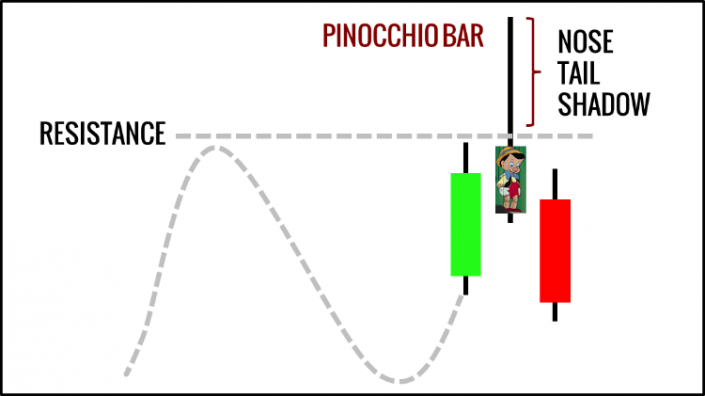 The Pinocchio bar (pin bar) is a very popular price pattern among active traders. In Martin Pring’s “Technical Analysis Explained”, he called the pattern Pinocchio because it lies. It lies about the market direction. And its long nose exposes the lie. So we expose the pin bar below. The concept behind pin bars explains its efficacy. 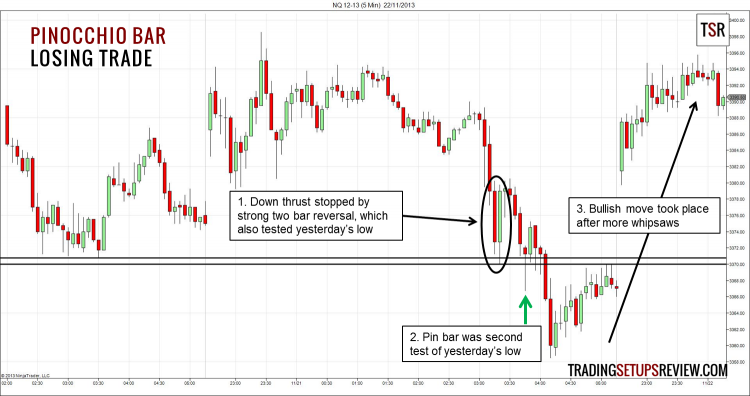 Traders place their entry orders and stop orders at support and resistance levels. Pin bars, by making a short-lived break of the levels, give false hope to traders in the wrong direction. As the pin bar closes back within the support or resistance, prices make a run for the other direction. This daily chart of AT&T shows a pin bar that began a swift down trend. There was an existing up trend followed by a cup and handle pattern that signaled the bull trend to continue. However, the cup and handle formation failed quickly with a pin bar that poked above the “cup rim” before closing below the resistance. After the pin bar triggered a short entry, prices tried to move up but could not gain momentum despite several tries. In fact, it was better to wait and enter after the failed attempts to move up. This is a 5-minute chart of E-mini futures on NASDAQ 100. We included part of the previous and next trading sessions to highlight the context of the trade. After a prolong congestion, prices broke down strongly and stopped at yesterday’s low with a two-bar reversal pattern. The pin bar was the second test of the low of yesterday’s session. Given that it was the second test of yesterday’s low, it was a good trade. However, we got stopped out quickly. After a final thrust down, prices drifted up and gapped up the next day to continue its way up. Indeed, there was buying pressure below the support tested by the pin bar. However, the pin bar was not the ideal entry point in this case. A pin bar is a unique price pattern because it is not defined by one, two, or even three bars. It is defined by the entire market structure. We can only label a pin bar after looking at support or resistance levels that it penetrated. Given the right context, the pin bar offers a reliable point of entry. Focus on pin bars that penetrate major support or resistance. Then, find confirmation from other indicators or chart patterns, and you have a high probability trade. When confirmation is lacking, it is a good idea to delay your entry. Let more price action unfold after the pin bar and enter if it confirms the pin bar. Need help find the pin bar on your charts? Get an indicator for five price action patterns including pin bar here. You should refer to Martin Pring’s solid work on technical analysis to learn more about the pin bar and other bar patterns. 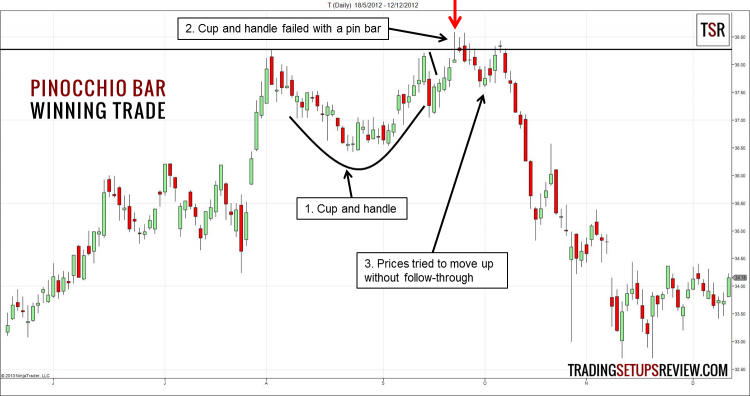 You can also take a look at the Thee-Bar Inside Bar Pattern, which is another great bar pattern to use in your trading. Can Price Action Trading be adapted to Long Term Stock Investments? If so, does your course/readings address this? i.e. Recognizing Entry/Exit points 1-Yr or longer Horizons for Stock Trades- or is this more suited for Day Traders only? Hi Larry, price action analysis can be helpful for long term stock investments. However, for long term investments of one year or longer, the role of fundamentals becomes a lot more critical. Hence, it’s best to use price action analysis to complement your fundamental analysis or an overall asset allocation strategy. For instance, according to your allocation strategy, you need to increase your position of a stock after it fell. 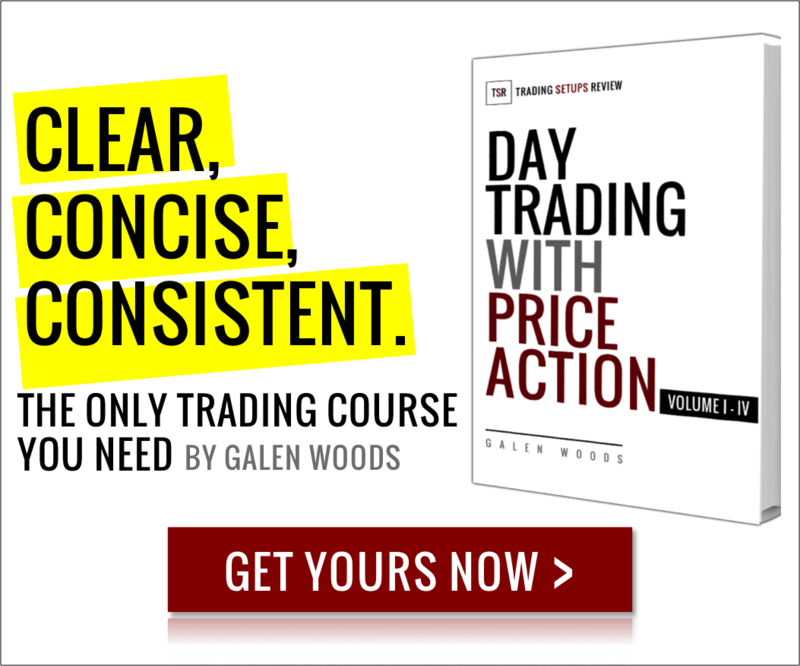 Provided that you’re still convinced that the stock is not overpriced fundamentally, you can use price action analysis to improve your exact buy timing. You can learn more about my course here from the FAQ, or email me directly if you have more questions.